Xeomin is a medically derived subunit of botulinum toxin type A called incobotulinum toxin A. Xeomin acts as a chemodenervation agent, which means that it weakens the muscles into which it is placed. The precise placement of xeomin into specific areas of the face will improve the appearance of fine lines and wrinkles. Xeomin works by weakening the muscles of facial expression that insert onto the surface of the skin. Weakening the pull of these muscles on the skin causes the visible wrinkles to flatten out. Over time, cumulative benefits are observed as the skin remodels without the negative influence of the wrinkle-creating facial muscles. What areas are commonly treated with Xeomin? Xeomin is used to treat dynamic facial wrinkles. The areas most commonly treated by Xeomin include the crow’s feet (lines around the eyes), worry lines between the eyebrows (vertical glabellar rhytids sometimes called the eleven lines or worry lines), and the lines across the forehead (horizontal rhytids). The effects of Xeomin are usually seen within 5 days. We have found that many of our Xeomin patients notice that the forehead lines are the first to improve within as soon as the next day. It will take up to 10 days to see the final results from the treatment. Xeomin treatment lasts anywhere from 3-6 months. Can I switch to Xeomin if I have used Botox and/or Dysport in the past? Yes. Since Xeomin acts in the same physiologic method as both Dysport and Botox, the products are interchangeable. The dosing however is different, so be sure to use a physician that has experience with Xeomin. Botox stopped working on me, will Xeomin work? This is actually a benefit of Xeomin. Xeomin is a “naked” molecule meaning that it does not contain the protein additives that Botox and Dysport have. Although it is rare, some people can develop antibioides to the protein additives within Botox, and Botox will stop working in those people. Xeomin does not contain any protein additives and will thus work in these types of patients. Will Xeomin make me lose all facial expression? Absolutely Not! The proper use of Xeomin, as Dyport and Botox, will lead to natural and effective improvements of your face. How long does it take to inject Xeomin? Xeomin injections are performed by Dr. Steiger and take between five to 15 minutes to perform. You may return to your normal activities immediately. We ask that you avoid any rubbing of your face. Patients are often apprehensive about the prospect of pain with any injection. We utilize special injection techniques and equipment to minimize or eliminate the pain of the injection. In fact, most patients are often surprised at how little they felt. Will you use a numbing cream on me before injection? At your request we will absolutely use topical numbing cream to prevent any pain with injection. Most of our patients stop requesting numbing cream once they experience Dr. Steiger’s pain-free injection techniques and equipment. However, we do have this available at all times should you request it. Xeomin is a very safe product that has passed the stringent guidleines of the US FDA for its safety profile in large clinical studies. What is the difference between Xeomin and Botox? What is the difference between Xeomin and Dysport ? On a molecular level, Xeomin is different from Botox and Dysport in that it does not contain any protein additives when packaged. The potential benefit of this is mainly for the rare patient who stopped responding to Botox treatments because of the development of antibiodies to the proteins. Since the Xeomin (incobotulinum toxin A) does not have any protein additives, it does not have to be refrigerated prior to opening the bottle. This has little benefit to patients, but potentially makes Xeomin a more environmentally friendly and green product. 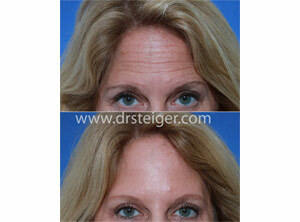 Experienced with Botox, Dysport and Xeomin, Dr. Steiger will help you select which product will be best for you. Can Xeomin lift my eyebrows? Yes. Xeomin, strategically placed in certain muscles around the eyes and forehead, will achieve brow elevation and the apperance of a brow lift or an eyelid lift. What other areas can Xeomin be used on? Xeomin, can be used to treat excessive underarm sweating, a condition called hyperhidrosis. It can also be used to reduce chin wrinkles, wrinkles around the mouth, and an excessively gummy smile. Xeomin can also used used to reduce the appearance of an overly square jaw, a technique called chemical jaw reduction. Do many people get Xeomin treatments? Absolutely. Botox is the most common cosmetic procedure performed in the world! Millions of people safely receive treatments each year. Xeomin is becoming increasingly popular and many patients have either started it for the first time or safely converted over from Botox or Dysport.